When Should A Vomiting Dog Go To The Vet? When in doubt, always go: it’s the safest approach. A vet will usually be able to quickly tell if the vomiting is serious or not, and whether other tests are needed. 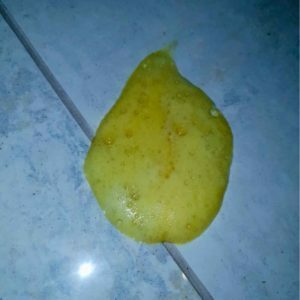 Is Dog Vomit Normally Yellow? The appearance of vomit in dogs can vary from undigested or partly digested food, to white froth. However, more commonly vomit without food will be stained yellow with bile. This bright pigment is transported from the duodenum by reverse peristalsis in the first stage of vomiting. There’s not much that you can learn from the appearance of vomit. Even small flecks of blood are quite common with prolonged vomiting. Your vet will be much more interested in assessing how well your dog is coping with the vomiting. Vomit can also contain grass. Do dogs eat it to make themselves sick or do dogs eat it because they feel sick? Discover the answer in our article about Why dogs and cats eat grass. I’ll start with the least serious causes. Does your dog vomit on car trips? 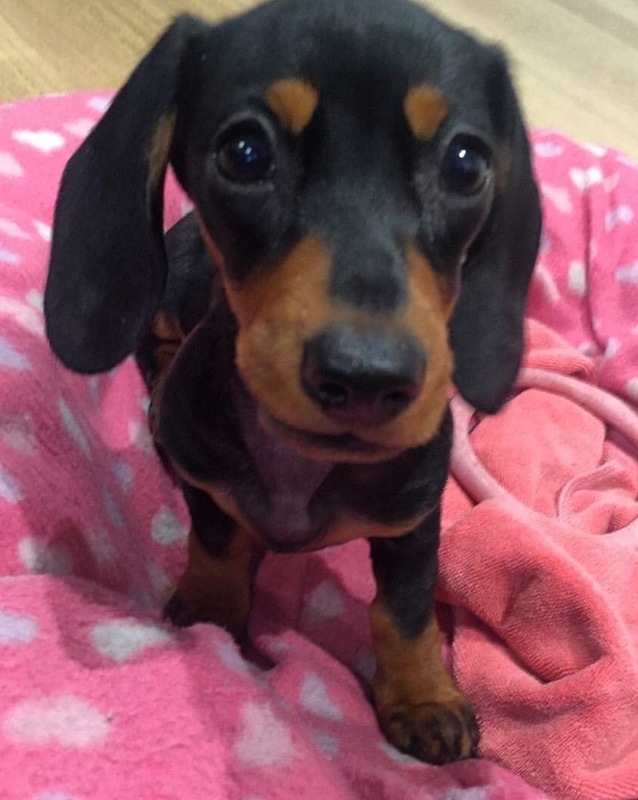 Nearly every puppy starts life being sick when they travel in the car, but most dogs grow out of it by the time they are one year old. Some dogs, sadly, do not. Cause: Some small breeds are prone to vomiting when they have an empty stomach. Think morning sickness for dogs. This is Miu Miu who started vomiting when I advised she should go down to one meal a day. Sorry, Miu Miu- it’s back to two smaller meals for you. Appearance: Bright, happy dog who only vomits yellow bile when their stomach is empty and is hungry straight after vomiting. Outcome: Should stop if food is given late at night or early morning. Does changing a dog’s food actually cause vomiting? I don’t think so, unless the dog is intolerant of that food or there’s something wrong with it. I do believe that diet change can cause diarrhoea, however. Don’t assume diet change is the cause unless all the other possibilities have been ruled out. 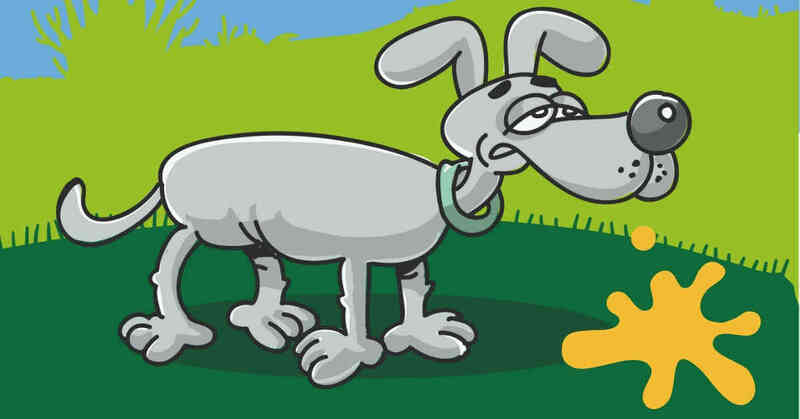 You don’t have to talk to many dog owners before you find one who’ll say “every time I feed my dog a certain food, they vomit.” Food intolerance isn’t well reported in the literature, mainly because it’s rarely very serious. Most dog owners quickly learn which foods to avoid. Sometimes food intolerance can stretch to involve an ingredient found in most dog foods. These dogs usually require either specially formulated hypoallergenic diets or home-made recipes. Read more about special dog allergy diets here. Cause: Dogs aren’t too fussy about what goes in their mouths. Sometimes it seems like they’ll try anything. Spoiled foods, dead birds, old faeces, you name it. Appearance: Bright, happy dog still keen on walks and play who can’t stop vomiting. Outcome: Some things cause irritation to the stomach, others cause infection but if it’s acute gastritis, it should pass quickly. Old and young animals often need a vet to suppress the vomiting to prevent dehydration. Cause: Intestinal worms and giardia commonly cause vomiting. Appearance: Usually puppies or dogs who haven’t been wormed for some time. Outcome: Good with an effective treatment. 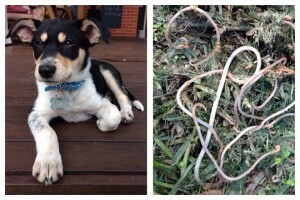 Read more about intestinal worms here. Cause: Accidental activation of pancreatic digestive enzymes inside the pancreas. Appearance: Quiet, unhappy dog off their food. Read a webpage devoted to pancreatitis here. Outcome: Can be fatal if not treated quickly. Cause: Broken toys, cooked bones, bones swallowed in chunks, satay sticks, corn cobs, fruit stones, twisted or telescoped bowel, narrow stomach outflow, constipation. Appearance: Repeated vomiting. Dogs can sometimes be very unwell, and other times be bright, happy and hungry. Outcome: Only a vet can save these dogs. See our advice on safer bone feeding for dogs. Many toxic substances can cause dogs to vomit. Some, like grapes or nurofen, are quite serious and need early treatment. Therefore, if you suspect vomiting is caused by a toxin, see the vet straight away. Click here for more on the common poisons of dogs. Bloat or GDV. 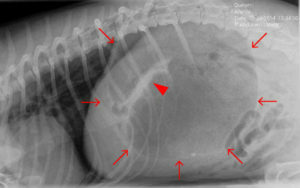 Small arrows show size of distended stomach. Large arrow shows ‘shelf’ caused by twist in stomach. Cause: Twisting of the stomach, especially after eating in deep-chested breeds such as Pointers, Setters, Shepherds, Dachshunds, Rottweilers & Great Danes. Appearance: Sudden onset of severe, unproductive retching, abdominal enlargement and distress. Outcome: Fatal without emergency veterinary decompression and surgery. See dogs at risk of GDV in our breed list and read about preventing bloat in dogs here. Cause: These can happen due to infections, but the most common cause we see is in dogs on anti-inflammatory treatment. Appearance: Persistent and usually worsening vomiting with loss of appetite. Outcome: Should resolve with gastroprotectant medications and stopping the anti-inflammatory. Cause: Parvovirus, distemper or coronavirus can all cause severe vomiting. Appearance: A very lethargic and sick dog. Click for more about parvovirus and distemper in dogs. Outcome: Many dogs will die, all will need intensive care at the vet. Appearance: Usually (but always) the dog will have signs of another illness. Outcome: Good or bad, depending on the underlying cause. I’m not going to suggest home remedies for vomiting in dogs. If your dog hasn’t already stopped, you need to take him or her to a vet. The greatest threats are dehydration, shock and sepsis, but sometimes we also treat dogs just to relieve their extreme distress. There are many specific treatments depending on the cause. Many times this is obvious to a vet after a thorough physical examination. Sometimes the vet may need to take X-rays, blood tests or perform an ultrasound examination to diagnose the problem. Is It Vomiting At All? Regurgitation is the passive flow of material from the mouth, such as in most oesophageal diseases or blockages. Dogs usually won’t heave their abdomen before this. Coughing! Yes, many coughing dogs look like they are vomiting, and only a good video can tell them apart. When dogs cough, they usually end it with a retch, gag and even sometimes bring up their stomach contents. 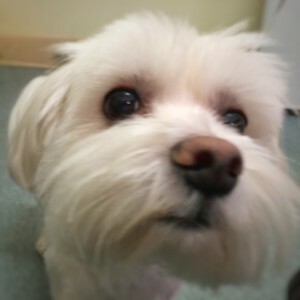 Only her owner sending us a video made us certain that Pippi here needed chest xrays. Does My Dog Also Have Diarrhoea? The vet will ask this. If you’re not sure, go outside and check the lawn closely. Can I Collect A Sample? Samples of vomit and diarrhoea aren’t always useful but are worth bringing just in case. By Andrew Spanner BVSc(Hons) MVetStud, a vet in Adelaide, Australia. These help topics are from a series regularly posted on Facebook and Twitter. The information provided here is not intended to be used as a substitute for going to the vet. If your pet has a problem, please seek veterinary attention. Previous PostPrevious What Diseases Does My Cat’s Breed Get? Next PostNext Are Staffy Cross Dogs Good Pets?